Home / How to Configure Parcel / Box Packing for WooCommerce FedEx Shipping? WooCommerce FedEx shipping is not a tough process anymore! 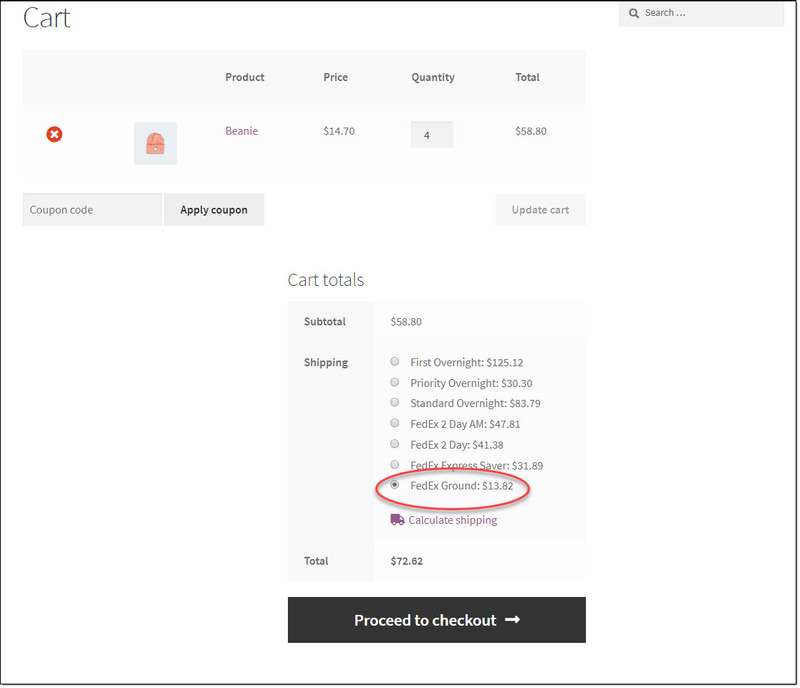 You probably got a better idea on displaying live FedEx shipping rates on your WooCommerce store as well as printing shipping labels directly from your store from our other articles. Now, we will look into the process of configuring parcel / box packing on your WooCommerce store. You can access the parcel packing options on the EasyPost plugin by going to WooCommerce > Settings > Shipping > EasyPost, and then clicking Packaging tab. Pack items individually – In this option, each item in an order will be packed individually. The total shipping cost of an order will be the sum total is calculated by adding the shipping cost of each item. If a customer purchases 4 items in an order, each of these items will be packed in separate packages. Accordingly the shipping rate also will increase. For example, the shipping cost for a particular FedEx service is $10, then a customer purchasing 4 units of that item, will be charged $40 as shipping charges. Pack into boxes with weight and dimensions – Here, you will define custom box sizes, into which the items will be packed. You will be able to define multiple boxes based on the the weight and dimensions of your products. The plugin will automatically choose the best box for a particular order. That means, if you have a custom box that will include all the four units of an item, you can offer your customers a much lower shipping rate. When you choose the second option, a new field will be displayed, where you can enter the box dimensions. You will be able to enter both outer and inner dimensions here. The outer dimensions are of the box, while inner dimensions define the product. Here, you can also include the weight of the box, if that is considerable. You can also specify, the maximum weight allowed in a particular box, so that packing will consider the weight of the product as well. This would mean that both dimensions and weight of a product will be considered when an order is automatically assigned a custom box. How to use FedEx boxes? EasyPost supports 19 predefined parcels of FedEx. 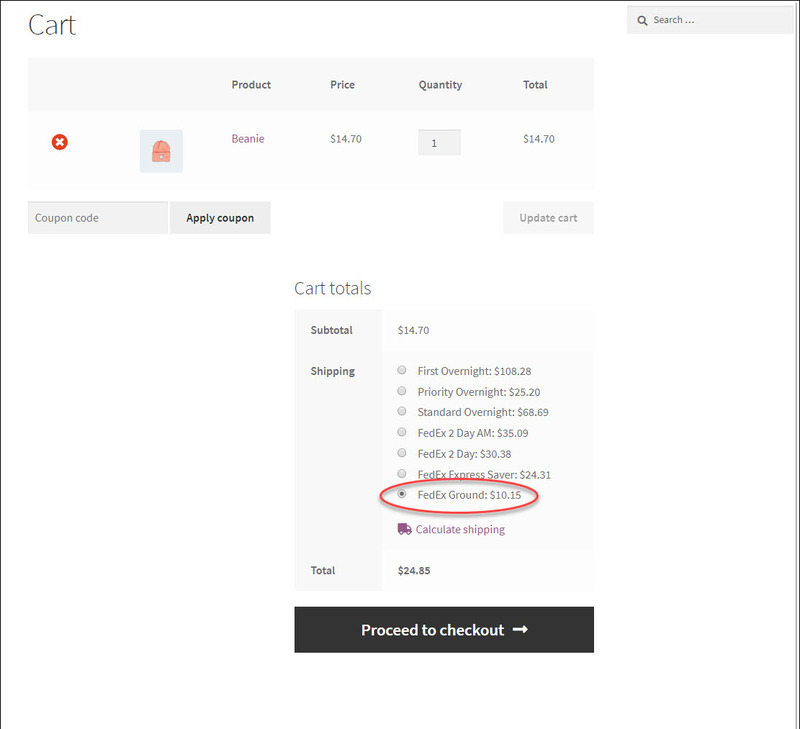 You can choose one of these options that works with your products, and define the box dimensions accordingly. You will find more information about EasyPost FedEX Predefined parcels here. Now let’s look at an example scenario to understand both parcel packing methods. First, let us configure “Pack items individually”. Here. each item in an order will be packed individually, irrespective of their weight and dimensions. In the plugin settings, choose “Pack items individually”, and click Save Changes. Now, let’s see how this will impact the shipping rates on the front end. 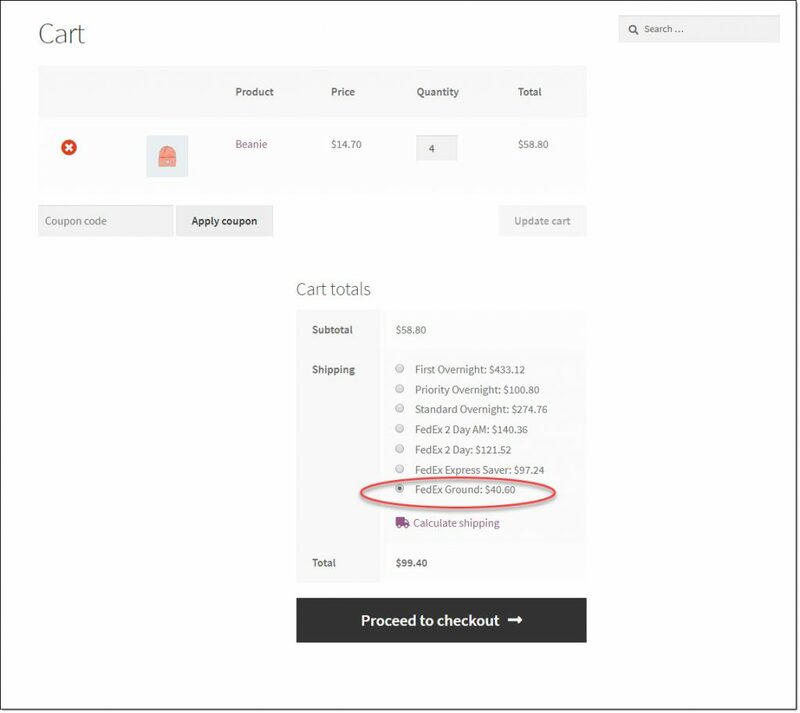 If the customer is purchasing just one item in an order, the shipping rates will be displayed as in the below screenshot. When the customer order 4 units of the same item, the shipping cost has become 4 times the original rate since each item is packed individually. If you are choosing the next option, “Pack items based on weight and dimensions”, you can define the box dimensions, and the items will be packed into a suitable box based on the product weight and dimensions. Now, let’s see what happens when a customer tries to order 4 items of the same product. You can see the shipping rate has only increased marginally, and not exponentially as you have seen in the previous case. This way, you can create your own custom boxes according to your business requirement, or use FedEx predefined parcels specified in your EasyPost account. For more details on setting up the ELEX EasyPost plugin, please read our documentation. For any clarifications regarding parcel packing, contact our support team.